These are my all-time favorite peanut butter cookies. They taste super good and the recipe is easy to memorize because of all the “1/2” measures. The peanut butter chips are a nice addition, but if you can’t find peanut butter chips you can leave them out. As for the peanut butter, I get the best results when I use a less-sweet no-stir natural peanut butter such as Skippy Natural. Preheat oven to 350 degrees F (176 C). Line a couple of cookie sheets with parchment paper or leave ungreased/un-lined. Beat the butter and both sugars together. Beat in the peanut butter and egg; Scrape sides of bowl and beat in the salt, baking soda and vanilla. When well blended, add flour and stir until it is blended. Stir in the chips. Shape dough into 1-inch balls (or scoop with a #70 scoop) and arrange on cookie sheets about 2 1/2-inches apart. Flatten balls with a fork making criss-cross patterns; Bake for 10-12 minutes or until slightly browned around the edges. **If you only have salted butter you can use that, but reduce the salt in the recipe to about 1/4 teaspoon. **If you have some, try adding about 1/4 teaspoon of chipotle powder to the batter. « Lizzie’s First Big Win! I made these again and used part PB chips and part Reese’s Pieces for the add ins. They turned out so good! I gave them away and they received rave reviews from the recipients. Hi, my husband & son love pb cookies so I’m on it! Will report the resorts I too will try the smuckers honey pb in the cookies cause I love it without the cookies! :) Thanks,*Q*. I should make these and send them to my younger daughter.She loves p b and chipolte anything.Mexican hot chocolate is good and they add some cayenne pepper to it. Mmm, I hope these are the peanut butter cookie recipe I’ve been searching for…forever! I’ve never found one that I loved. I’ll give this one a try! WOW! Great PB cookie! I added chocolate chips instead and they were awesome. I also made the cookies larger (2 inch balls) and the thick chewy texture was yummy. Thanks a ton! Great website. 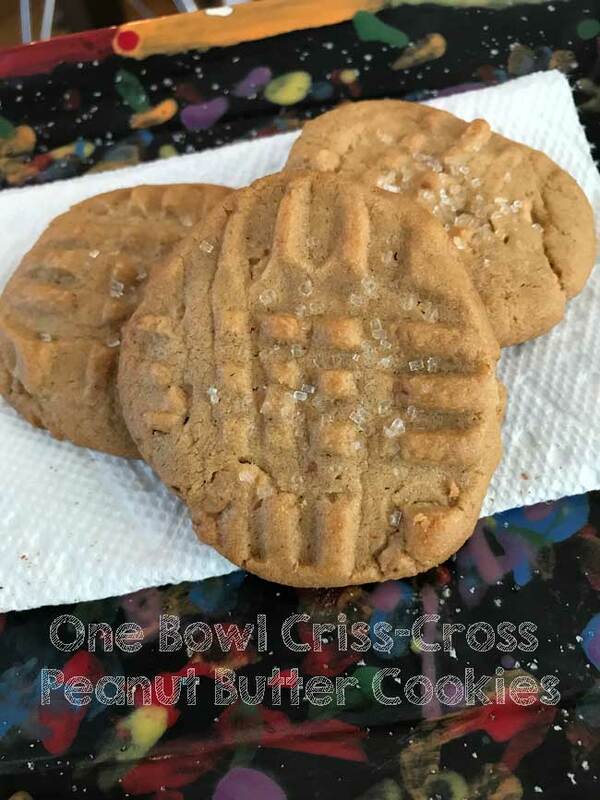 Looking at this recipe and a few others, I tried a variation yesterday to make them even more peanut buttery! The biggest change was doubling the amount of creamy peanut butter in place of peanut butter chips – I was interested to see how that might taste. I think they came out very well. I also made some with different kinds of chips, but I definitely preferred the no-chip version the best. Maybe next time I’ll try a little more salt to make them more like a Reese’s Peanut Butter Cup cookie. Thanks for a great recipe! Thanks Cindy! If you liked this version of the cookies, I dare you to try the chipotle version. It’s this recipe plus 1/4 teaspoon chipotle powder (McCormick). Sounds crazy but it very good. I just found your blog and I love it. I have not made peanut butter cookies in years. My husband loves them poor thing, because I like peanut butter, but don’t care for anything made with it. The pictures of your criss-cross peanut butter cookies looked so—good just had to make them. When my husband saw I was making the cookies he was grinning from ear to ear. You made a happy camper out of him. They was so easy to make, turned out beautiful. I ate three and enjoyed them very much. Thank you for the lovely picture, and cookie recipe. Oh My!!! I finally got around to making these and all I can say is, they really are “the-best-in-the-whole-wide-world-sorry-but-that-is-true peanut butter cookies”!!! My son is going to be so thrilled to find these in the box when they arrive! Thanks for another OUTSTANDING recipe! Liz, thanks for the tip! I will try the Smucker’s with honey. I just thought I would chime in about the natural peanut butter, since I saw a mention of it recently. There are two different companies that I know of that are making natural peanut butter that they sweeten with honey. Smucker’s is one, and the other is from Arrowhead Mills. So, if you find the plain peanut butter to be too intense (I do too! ), this might be a better fit for you. Definitely not as sweet as Jif or Skippy, but I think the honey-sweetened peanut butters are really tasty! Also, I have found that my peanut butter cookies are much more fluffy and tasty since I made the switch. These look great. Perfect for munching on in the afternoon. I am having a creative rut ALSO…. I have a BUNCO party next week. Farmers Market is the theme. I wish you could come too!!! And bring your puppy…he is soooooooo CUTE! I LOVE peanut butter cookies!!!! These look righteous!! Congrats on the frosty paws contest….he is STAR!!!!!! Are you going to watch the Doggie reality show that is coming on the tube? That show looks cute! One word describes this…. YUM. So this is NOT the Old Fashioned PB recipe? I made those and the KA’s Triple Plays today, will try to get them posted tonight. I actually really like them both, but (and don’t be mad–just kidding)I think I like the Old Fashioned ones a little better. Check out my blog later. 😉 Thanks for the recipes. 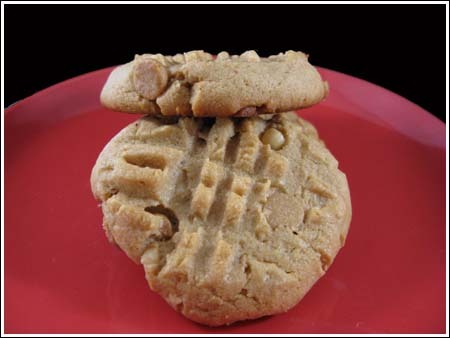 Such classic pb cookies, with the criss-cross. Yum! YUM!!! I love the pics and updates daily!